– By Sharon Rowe, Founder of ECOBAGS brand. I walk to work everyday. It’s about a one mile walk down the main street of my “village” which is about 45 minutes north of NYC. Not too many people walk. On this particular day I decided to take pictures of all the random plastic bags and bits I saw along my route. Why? We’re showing “BagIt”, the movie, in a few weeks as part of a film series, the Ossining Documentary and Discussion series. I decided it would be a good idea to do a slide show as people enter the theatre and share my “findings.” Most people drive and don’t notice all the plastic debris which is part of the problem, as I see it. When you drive by at 30mph you’re in a different reality. As I was walking I started to have that good feeling. The feeling like I am part of the solution, the personal awakening and sharing of seeing how much plastic is littering our village. But then, I decided to get a cup of coffee at a local cafe. I pass this cafe everyday but never stopped in. As I was “parking” my dog, Bear, the owner asked if I’d like coffee. I said “yes, with milk” and went inside to get it and pay him. That’s when I went from feeling like I was part of the solution to understanding how deep the problem is. The owner handed me my coffee in a styrofoam cup. I paused. I asked, “do you have any other types of cups? Does your restaurant supply distributor only have these?” He looked at me in a weird way, partially because he didn’t understand my question in English. I paid for the coffee and left with my styrofoam cup. Good coffee, bad cup, feeling bad. If I was in Santa Cruz or Boulder or Seattle this would be a non issue. 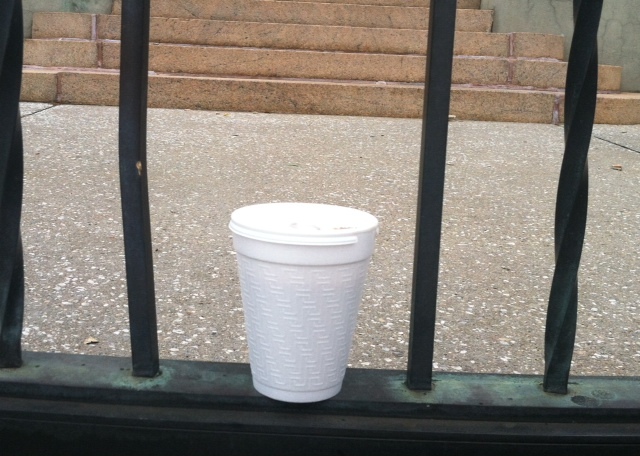 With zero waste initiatives in communities, styrofoam has been removed from the supply chain. But here, just north of NYC, I learned that if I want to stay on the “solution” path, I have to ask to see the cup before I get my coffee in any local business or, better yet, I have to bring my own mug wherever I go. The next step is bigger. I need to step up my game, get more involved and generate an agenda of zero waste in our village in order to finds ways to inspire community members and incentivize shops and cafes to choose different cups and containers. I don’t think “coffee to go” will stop but I can stop being part of the problem.